The founder of the American League, Johnson was arguably the most powerful man in baseball during the first quarter of the 20th century. 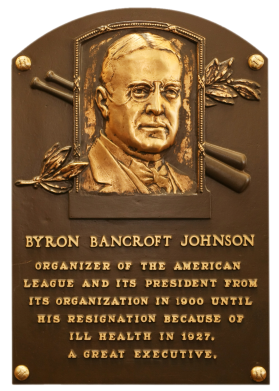 When the minor Western League folded in 1893, Johnson revived it. He put it on solid footing and made it a major league in 1901. 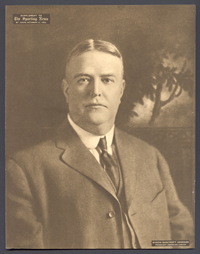 The Black Sox scandal of 1920 undermined his power, however, and led to the Commissioner system, leading to Johnson's retirement in 1927. 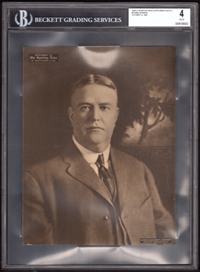 Comments: Like many of the other executives and early 19th century players in the Hall of Fame, I purchased a Callahan tribute card for Johnson to get the ball rolling - a PSA 7 in October, 2003. I upgraded to a PSA 8 in December, 2003 with an eBay purchase. In December, 2004 I finally got an issue contemporary to Ban's career when I bought an ugly Fan Craze example off eBay. His hair in the photo cracked me up. I remember the card has lots of issues - looking like it had gone through a fire. I eventually had it graded by PSA and it came back a PR-FR 1. Anyway, I upgraded to a PSA 6 in May, 2005 with a purchase off Net54. In April, 2007 I decided to part with the Fan Craze as I also had Elmer Flick representing the issue. I replaced it with this newspaper supplement when I found it on eBay. Eventually I'd like to get it graded by Beckett to at a minimum protect it - SGC and PSA don't grade supplements. UPDATE: In early 2014 I decided to sign up for a Beckett grading membership with the understanding it included free gradings. 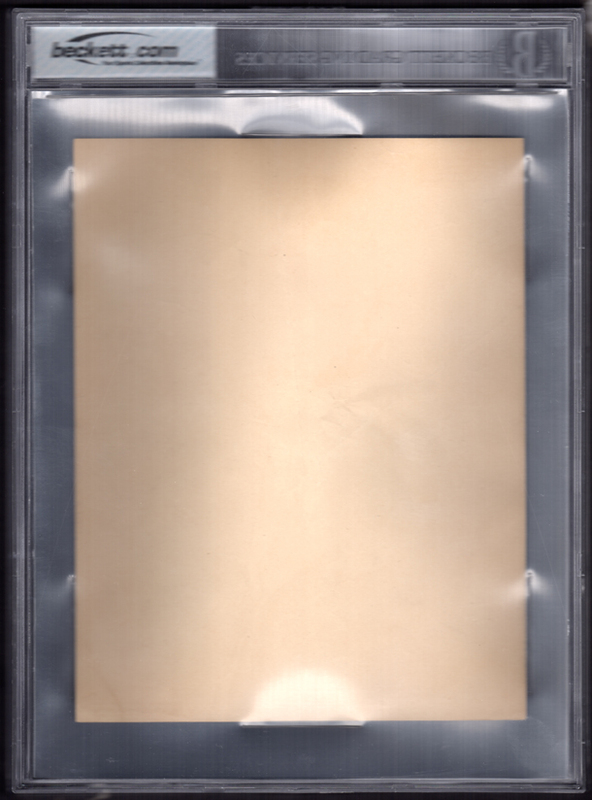 SGC and PSA won't grade newspaper supplements but I wanted them slabbed for protection. I submitted this 1909 Johnson along with a couple other Sporting News inserts (Kid Nichols and Pie Traynor), several modern sketch cards and the cards were returned to me in June, 2014. The M101-2 came back graded VG-EX 4 and very happy to have it in a holder. Description: Among the finest large-format baseball collectibles published in the early part of the 20th Century was the 100-piece series of sepia-toned supplements issued by The Sporting News. Generally 8" X 10" (though there was some size variation over the years), the series was begun with the insertion of a supplement in the July 22, 1909, issue of TSN. One supplement was issued with each week's paper through April 7, 1910. There were several gaps over the course of the next several years, until the final piece was issued with the TSN dated Dec. 11, 1913. Most of the supplements feature full-length poses of the players. Each is labeled "Supplement to The Sporting News" with the date at top. At bottom is a box with the player's name and team. Backs are blank. The TSN supplements were printed on heavy paper and are usually found with corner creases or other signs of wear.